When the poor pooch had barked one too many barks one recent morning, I tied him up to my bike and determined to wear him smack out, no matter the cost to me and my laziness. 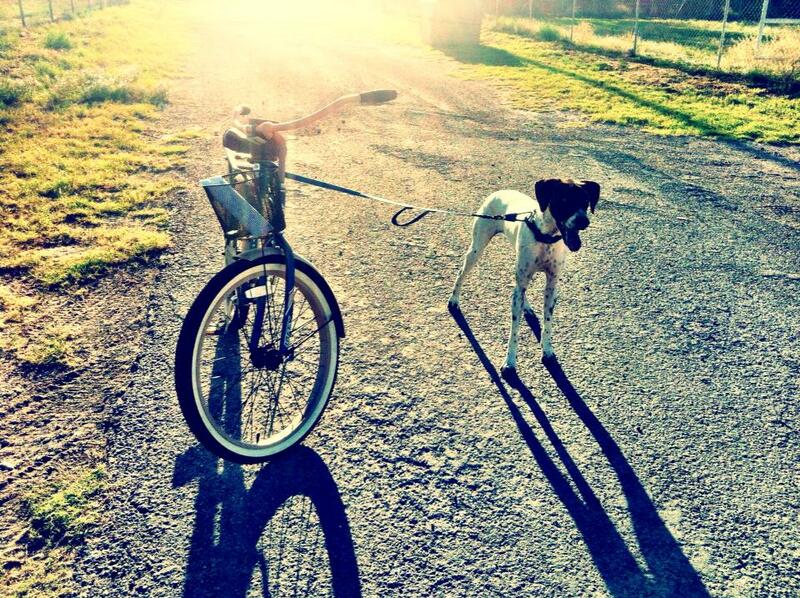 I'd ride into the sunset if it meant the result would be a tired dog who would leave me the heck alone. I was done with him! Finally! The dog was panting as if he'd run a marathon in 10 minutes! And, he was seemingly out of my business! Success!!!! I won! "I'll win every time, you just hide and watch!" I boasted to the poor little guy sprawled out on my tile floor, struggling to catch his breath. 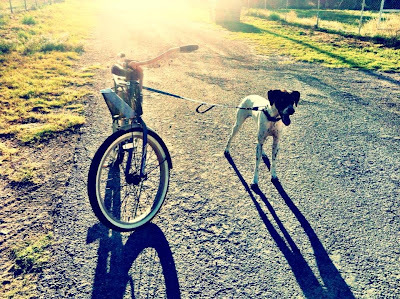 I made it a point to take the delinquent dog on a ride every day, for several days in a row. It was the only way we could stand to live in a house with him. We wanted to watch TV and play Candy Crush in peace. Is that too much to ask? :) He wouldn't go down without a fight, but I was determined to win, and I did... or so, I thought. After a few days of hard running alongside my bike, poor Jethro started limping around the house, with an obvious injury. He hobbled from one room to the next, picking up his front right leg with every step. I stopped him on one of his thousand trips from one end of the house to the other and examined his paws. I immediately noticed a big, nasty blister on one of his front paws. Ouch! He needed tennis shoes! He wasn't equipped to do so much running! My husband quickly got online and ordered our baby dog some shoes, so that his feet wouldn't wear out on his journey. You know, I've had the same experience as sweet Jethro as I've journeyed through life. Sometimes, I'll prematurely set out on a path. Maybe God hasn't fully opened a door, but I barge through it anyway. Or, maybe I set out on a journey, but don't seek God to outfit me appropriately. Then, I end up wounded because I'm racing without the proper gear. Jethro has taught me to wait. Wait until God says "GO"! Wait until God says, "It's time!" Wait until God does the equipping! Even if I feel confident in my ability to run, even if I feel particularly talented, I'm doomed for injury if I don't operate in God's timing and equipping, and you are, too. Let's wait upon the Lord to show us the way, equip us in His purpose, and outfit us in His truth. May God equip you with every good gift, according to His sovereign purpose for your life! I know this sounds random, but please be careful when riding with your dog. my husband did that to wear out our dog and our dog ended up causing him to wreck, break his collarbone and required a plate and ten screws. Great Lindsay. Good lesson. I am so looking forward to hearing you in person in Sept. So ready. All the girls 9women) are asking all kinds of questions about you. They are very eager to meet you and get to know you. Any questions - let me know.